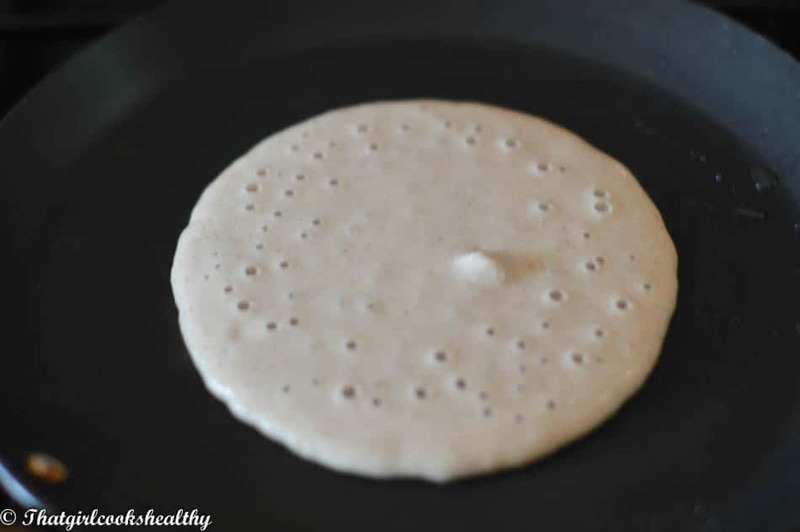 Cinnamon gluten free buckwheat pancakes -These delicious wheat free cinnamon infused buckwheat pancakes are dairy free and make the healthiest breakfast. Wakey!Wakey! 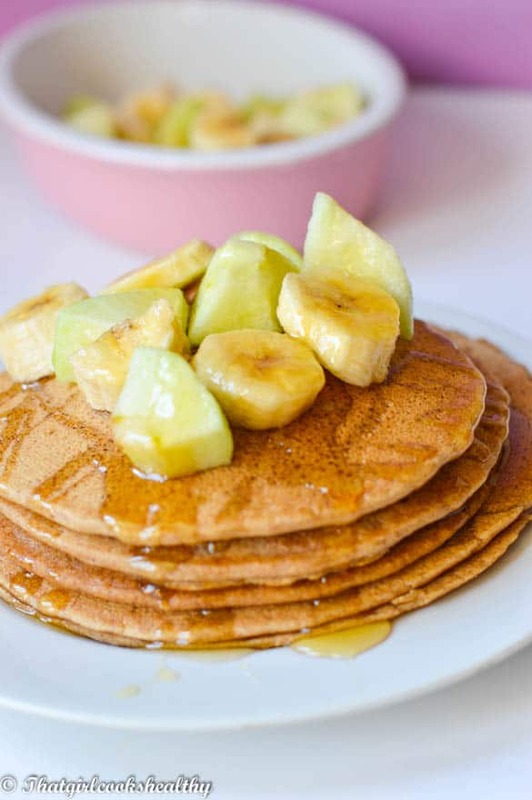 Rise and shine sleeping head, it’s time for some cinnamon gluten free buckwheat pancakes. Are you fedup of eating the same thing over and over again? Are you looking for some variety that’s simple, tasty and healthy – all in one serving? Well let me introduce my new gluten free best friend…….BUCKWHEAT FLOUR….Yup that’s right. you heard Buckwheat. Contrary to the name, buckwheat is actually a member of the rhubarb family. what’s more it’s gluten free making it a more viable alternative for people with gastrointestinal problems like celiac, IBS or other autoimmune disease which may have an impact on the lining of the gut. 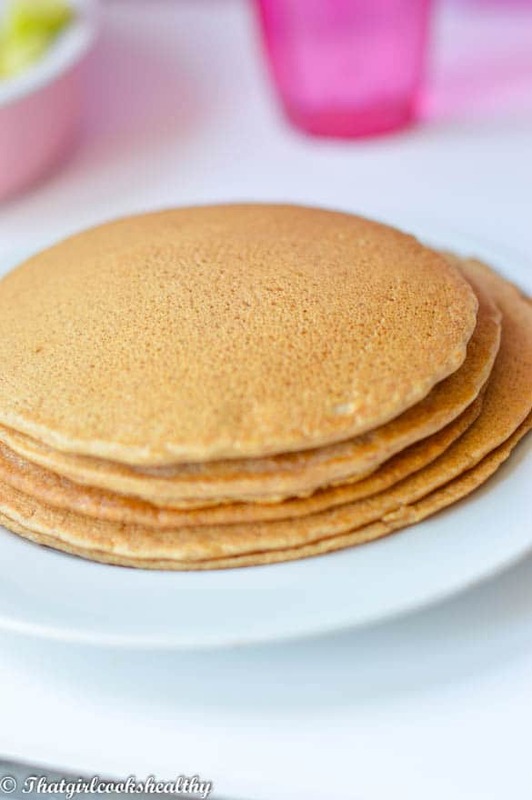 What I love about buckwheat flour is how versatile it is and it’s lovely nutty flavour. The texture is more on the softer side with a hint of denseness but nothing too major. Some people prefer to pair it with another flour to remove that slightly dense edge. 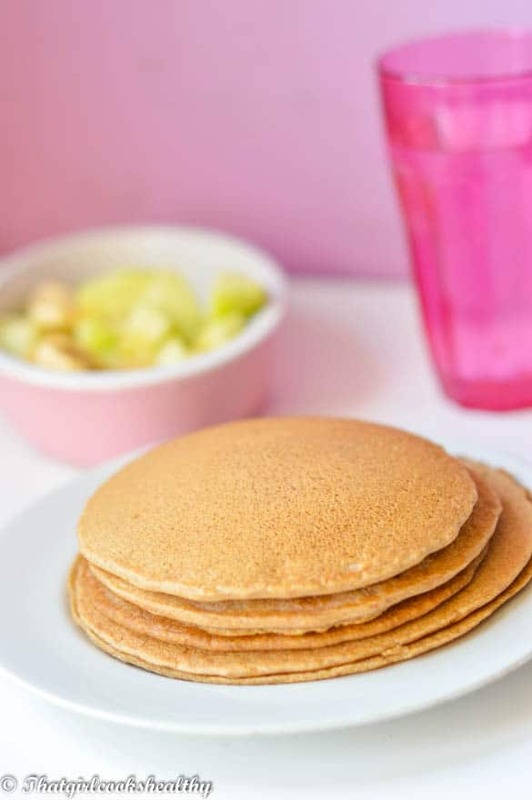 However, I find these pancakes to be light, airy and palatable – I didn’t experience any bloating or any other extreme gut problems, so it’s a keeper for me. While we are on the subject of health buckwheat seems to be a good choice for blood sugar level management which means it’s suitable for diabetes as the glucose isn’t disturbed upon consumption. As an Afro-Caribbean woman, where diabetes and hypertension is quite rife amongst people of colour (as a collective). If you’re reading this then I urge you to ditch the white refined flour because it attributes to some of the issues pertaining to the function of insulin. 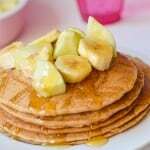 How long do the pancakes take to cook along with the preparation? Less than 20 minutes of your time from start prep to cooking time. I value my own time so in turn I appreciate how precious your time is and want to help you make the most of starting your day vibrant and healthy. 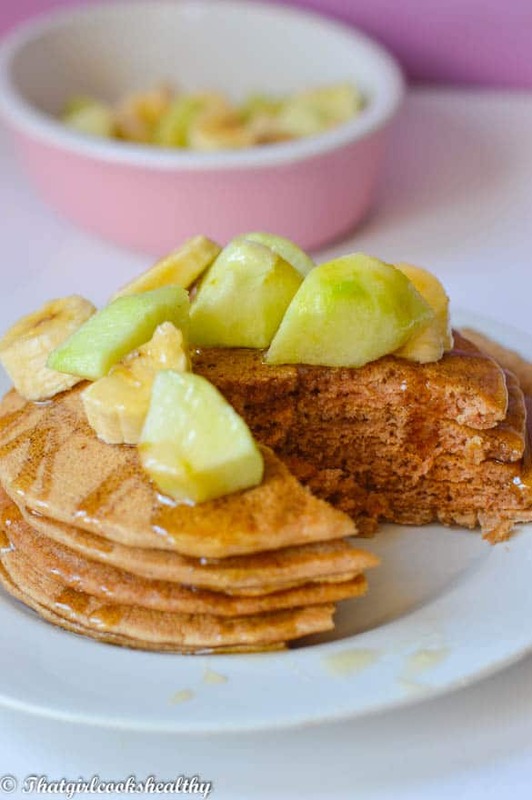 Let’s not be boring again, we can be as creative as we like here – buckwheat pancakes infused with cinnamon – spicy, light and fluffy with a dollop of coconut nectar and a selection of fruit – low GI and gut friendly. In a medium sized bowl add the flour, palm sugar, baking soda and powder, vanilla, cinnamon, salt and combine with a whisk. In a separate bowl beat the egg with the coconut milk. Pour the wet ingredients into the dry bowl and mix with an immersion stick blender until the batter is smooth and not too runny. Preheat the pan on low to medium heat and add a splash of coconut oil and rotate around. Ladle the amount of pancake batter desired onto the pan and allow to cook until golden brown. Flip over the pancake and brown the other side. Repeat the previous step with the remaining batter. 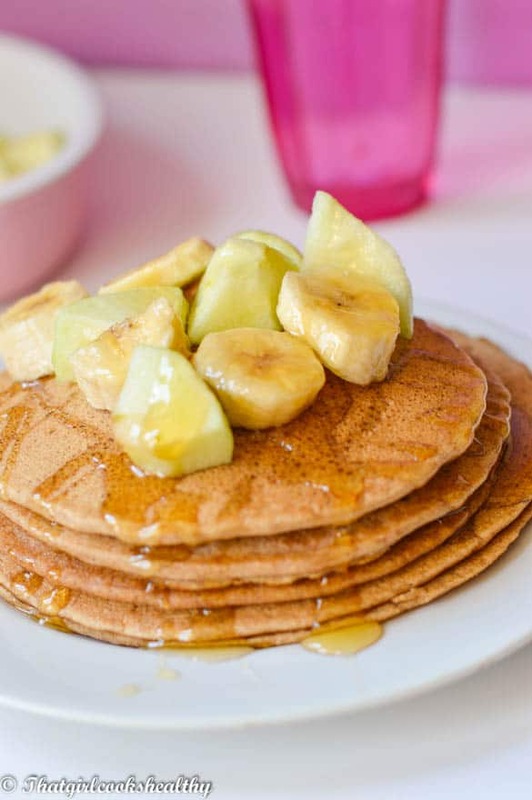 drizzle coconut nectar on the pile of pancakes and garnish with banana and coconut. I absolutely love how you take pictures!! Your recipes look amazing too! Thank you so much Yasmeen, your comment means a lot to me. Love your pictures and step-by-step instructions for recipe. I really enjoy Caribbean food, will cook some stew beef today. Thank you and glad to hear you’re a fan of Caribbean food.